At first the coat of arms was a practical matter which served a function on the battlefield and in tournaments. With his helmet covering his face, and armour encasing the knight from head to foot, the only means of identification for his followers was the insignia painted on his shield and embroidered on his surcoat, the flowing and draped garment worn over the armour. Crest: This is the smaller image that sits on the ‘torse‘ above the ‘helmet‘ (or ‘helm‘). Shield: This is the main part of the coat of arms containing the charges (images), layout and colours. The shield is also called an ‘escutcheon‘ and ‘arms‘. Motto: A motto (if recorded) will normally appear on the banner above the crest and is usually recorded in Latin, French, Welsh, Gaelic or English. Surname: The surname of the person the coat of arms was granted to will normally appear on the banner at the bottom of the coat of arms (family crest). Charge or Charges: These are the images appearing on the shield. A smaller image placed on another image will use the word ‘charged‘, for example, “an eagle displayed proper ‘charged’ with a gold crescent on the chest“. Chief: This is used to describe the upper area of the shield. Base: The base is the lower area of the shield. Torse: The ‘torse‘ or ‘wreath‘ is a twisted roll of fabric comprising of six parts with alternating colours to match the mantle (i.e. silver and blue). The torse sits directly on the helmet below the crest. Helmet: This is a knight’s helmet (also called a ‘helm‘ or ‘peer’s helm‘) and is placed above the shield bearing the torse and crest. 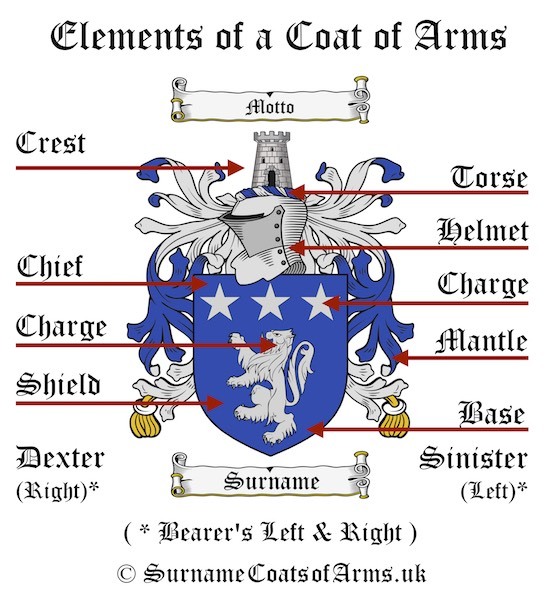 Mantle: The mantle (or ‘mantling‘) is an ornamental drapery used to display the shield and helmet which makes up the coat of arms image. The mantle colours should be one of the main colours (tinctures – see below) with one metallic colour (silver or gold) – not two metallic colours together or two main colours together – and will match the alternating colours used on the torse. Dexter: This is the right side of the coat of arms from the bearer’s point of view. Sinister: This is the left side of the coat of arms from the bearer’s point of view. Some coats of arms include ‘supporters‘ shown on either side of the shield. Please note that these are not included with our coats of arms images. Argent (Silver): This is silver or silvery white and is one of the two metal tinctures. “Ar.” is the abridged version of Argent. The precious stone associated with Argent is Pearl and the planet Luna. Or (Gold): This is the gold tincture and the other metallic colour used. “Or” is how this appears in heraldic blazons. The precious stone associated with Or is Topaz and the planet Sol. Sable (Black): “Sa.” is the abridged version of Sable. This tincture is associated with the precious stone Diamond and the planet Saturn. Gules (Red): “Gu.” is the abridged version of Gules. This tincture is associated with the precious stone Ruby and the planet Mars. Azure (Blue): “Az.” is the abridged version of Azure. This tincture is associated with the precious stone Sapphire and the planet Jupiter. Vert (Green): “Vert” is how this appears in heraldic blazons. This tincture is associated with the precious stone Emerald and the planet Venus. Purpure (Purple): “Purp.” is the abridged version of Purple. This tincture is associated with the precious stone Amethyst and the planet Mercury. Purple is rarely used in heraldry. The word ‘proper‘ is used in heraldry to mean the natural colour of something. For example, ‘a salmon proper‘ would be the natural salmon colours of silver and pink, or ‘a bear proper‘ would typically be shown as brown or black.